I am ACTUALLY painting ALL of these photos above... I will show them SOON... stay tuned... they will be AVAILABLE for PURCHASE as prints and frameable notecards and possibly ORIGINAL PAINTINGS!!! Don't YOU love Farmer's Markets? Looking for more Outdoor Adventures... be sure to visit other Outdoor Wednesday participants via A Southern Daydreamer! Fresh veggies are available at Farmer's Markets. What's not to like? We really, really, really, really like the taste of home grown tomatoes rather than the hot house ones. As always your blog is amazing! Wonderful fresh looking photo;s a good start to my day. Me too! Can't wait to see your paintings! I'm sure they will capture the essence of the farmer's market! Wonderful photos from the farmers markets. The veggies and flowers look beautiful. I would enjoy roaming through a market like that. Beautiful photos and I'm sure your paintings will be even more wonderful. We have several farmer's markets very close to my house and I love being able to get fresh veg all summer! I cant wait to see your paintings! Wish we had a market like that here. All the produce looks so fresh. You are a very talented lady to paint so well. I will be looking forward to seeing them as I love art work. Lovely photos. Can't wait to see your paintings! Dropping by from Outdoor Wednesday, #3. If you haven't already registered for our vessel sink giveaway there's still time! I DO love Farmer's Markets and I can't wait to see your paintings! I love a farmers market. I don't get to them enough, but the sights, the colors, it all is a treat for the senses. I love to shop this way!! So why do we have Malls? Looks like an amazing Farmer's Market. The photos are beautiful, can't wait to see your paintings of them. I WISH I had a gorgeous farmer's market like that near me. Sigh. I'm already a proud follower on here and Twitter! And wait...what? They have SHOES? I do love outdoor markets, and I really LoVe your paintings!!! Your photos are really beautiful. Love all these pictures. Its so fun to go to a farmers market. but ours isnt this nice. All of these will make wonderful Fifi paintings. Look forward to seeing them. Oh yes, I do love the street markets, anywhere. I've been known to stop on the side of the Grand Corniche, buy a case of apicots, eat them in the car and ruin the designer outfit I had on that day. Come see me, and maybe you can plan on attending our virtual party next week, wearing your money-is-no-object virtual dress. your paintings will be gorgeous! love those images, especially the pink bike i believe is vicki's! I do love going to a farmer's market. And, we are lucky enough to live within thirty minutes of our state farmer's market. It is wonderful. I love going to our local farmer's markets. There is one I go to on Friday's during my lunch hour sometimes but I prefer the one near my home that is open on Saturdays. 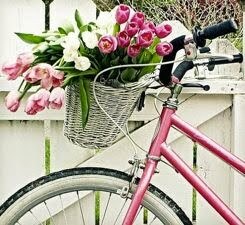 I love the sunflowers in the first picture and the fabulous pink bike with its basket of beautiful flowers. 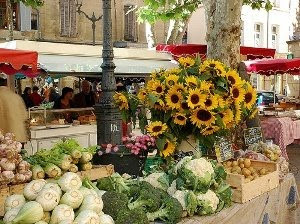 I LOVE farmer's markets...those sunflowers in the first pix are outstanding! I know your paintings will be fab! I love farmer's markets, too. I think some of my very best photographs are the ones taken at these markets. The colors and textures are such an inspiration. Can't wait to see your beautiful paintings!